Look up pinnation in Wiktionary, the free dictionary. 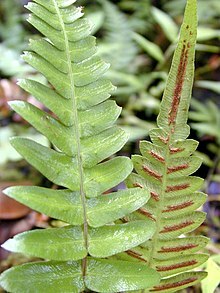 A simple pinnate (unipinnate) frond of the fern, Blechnum appendiculatum. Pinnation (also called pennation) is the arrangement of feather-like or multi-divided features arising from both sides of a common axis. Pinnation occurs in biological morphology, in crystals, such as some forms of ice or metal crystals, and in patterns of erosion or stream beds. The term derives from the Latin word pinna meaning "feather", "wing", or "fin". A similar concept is pectination, which is a comb-like arrangement of parts (arising from one side of an axis only). Pinnation is commonly referred to in contrast to palmation, in which the parts or structures radiate out from a common point. The terms pinnation and pennation are cognate, and although they are sometimes used distinctly, there is no consistent difference in the meaning or usage of the two words. pinnatifid and pinnatipartite: leaves with pinnate lobes that are not discrete, remaining sufficiently connected to each other that they are not separate leaflets. pinnatisect: cut all the way to the midrib or other axis, but with the bases of the pinnae not contracted to form discrete leaflets. pinnate-pinnatifid: pinnate, with the pinnae being pinnatifid. paripinnate: pinnately compound leaves in which leaflets are borne in pairs along the rachis without a single terminal leaflet; also called "even-pinnate". imparipinnate: pinnately compound leaves in which there is a lone terminal leaflet rather than a terminal pair of leaflets; also called "odd-pinnate". bipinnate: pinnately compound leaves in which the leaflets are themselves pinnately compound; also called "twice-pinnate". tripinnate: pinnately compound leaves in which the leaflets are themselves bipinnate; also called "thrice-pinnate". tetrapinnate: pinnately compound leaves in which the leaflets are themselves tripinnate. unipinnate: solitary compound leaf with a row of leaflets arranged along each side of a common rachis. The term pinnula (plural: pinnulae) is the Latin diminutive of pinna (plural: pinnae); either as such or in the Anglicised form: pinnule, it is differently defined by various authorities. Some apply it to the leaflets of a pinna, especially the leaflets of bipinnate or tripinnate leaves. Others also or alternatively apply it to second or third order divisions of a bipinnate or tripinnate leaf. It is the ultimate free division (or leaflet) of a compound leaf, or a pinnate subdivision of a multipinnate leaf. The fish Platax pinnatus is known as the pinnate spadefish or pinnate batfish. Pinnation occurs in certain waterway systems in which all major tributary streams enter the main channels by flowing in one direction at an oblique angle. ^ Journal of the Electrochemical Society, Volume 100, 1953, page 165: "The zinc is recovered electrolytically as "flake" powder consisting of pinnate crystals." This page was last edited on 13 December 2018, at 04:22 (UTC).